This year, 20 Journeyman teams, 49 apprentices, and 21 groundman took part in SCE's Lineman’s Rodeo. This year's overall Journeyman team winner included (l-r): Ramon Garcia, Jacob Lybbert and Wil Robinson. A 360 degree view of SCE's Lineman's Rodeo. The top finishers will head to Kansas in October for the International Lineman’s Rodeo. Jacob Lybbert, 33, grew up watching his lineman dad drive the big trucks and enjoyed watching the guys throw rope from pole to pole as they strung wire and climbed up the big electric poles. He even remembers watching his dad judge the lineman’s rodeo competitions. 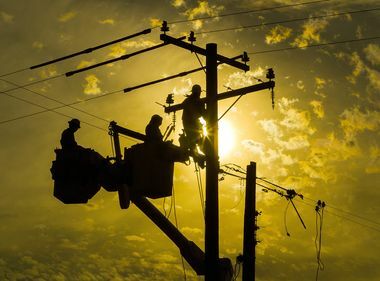 Now a lineman himself for Southern California Edison, Lybbert and his teammates, Wil Robinson and Ramon Garcia, recently took home the top prize at the company’s annual picnic and lineman’s rodeo. And winning is something this trio is getting used to as they take part in competitions across the country and prepare for the International Lineman’s Rodeo this October in Kansas. 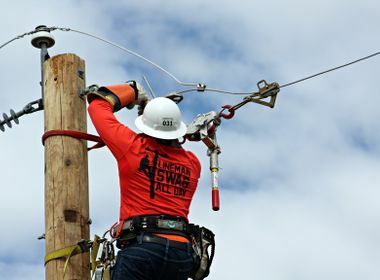 Dozens of lineman, groundman and apprentice teams from various utilities competed in events like the Hurtman Rescue, Pole Climb and 12Kv Over-the-Arm Tap Installation at SCE’s rodeo. The top finishers will now head to Kansas where competitors from all over the world will be represented. This will be Lybbert’s sixth time heading to Kansas. He enjoys the camaraderie with his fellow lineman and the opportunities to share stories. The event is also a time to talk about how everyone works to stay safe and to share safety tips. The International Lineman’s Rodeo has a safety conference and trade show where new tools, equipment and safe work practices are discussed. 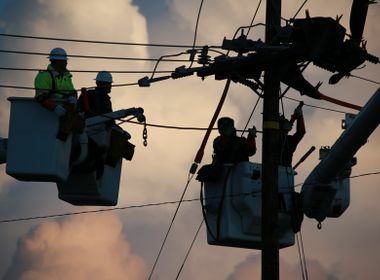 “For our lineman, it’s an opportunity to not only showcase their skills and compete against the best in the industry, but show pride in their craft,” said Robert Torres, an SCE manager in the Covina District.